The driveway and patio is very often the focal point for most homes. These areas are often the first impression most visitors will have especially if your home is up for sale it is one of the first things any potential buyer will view. We use only the highest quality environmentally friendly products and advance professional equipment to ensure you receive a long lasting cleaning service for your homes driveway or patio. We first start by jet washing the existing driveway then once the dirt and sand is removed a weed treatment is applied and when this has dried out we re-sand the driveway to ensure a longer lasting result. We supply professional patio cleaning on all types of surface, Concrete, Wood, Composite, Pavers, Stone, Brick and Stamped Concrete just to name a few. If you are looking to remove some unsightly green, black marks on your patio surface we can kill up to 99% of algae, bacteria and mould that would be on the surface of your patio. We maintain commercial and residential patio’s all year round for lots of our client’s, particularly one’s that have a large amount of foot traffic such as shops and restaurants. As trained professionals we can ensure that every surface type is treated accordingly to avoid any unnecessary damage, both long term and short. We have the latest equipment currently used in our industry and leave your patio with a finish that makes it appear years younger. Most of our patio cleaning projects are handled within days depending on the size and condition of the surface. Patio cleaning can require a lot of work with domestic shop bought pressure washing equipment which could take up many hours of your valuable time. Our driveway jet washing process will remove grime, dirt, most oil stains, tyre marks, moss, algae and weeds . We will restore your driveway to its former glory and original condition. After the jetting process we will also apply treatments and sealants to protect surfaces and keep future maintenance to a minimum. 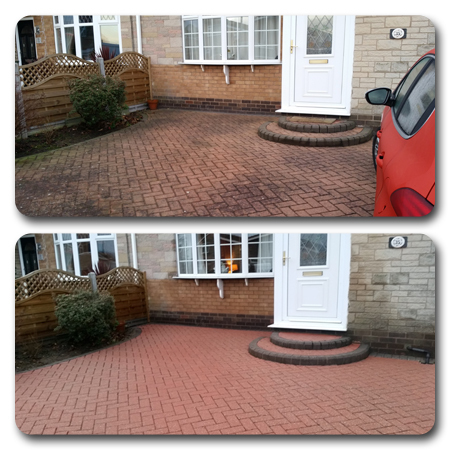 We have been driveway cleaning in Hull for over 20 years. During this time we have successfully cleaned hundreds of driveways in the Hull area. Taking great pride in all jobs that we undertake we have managed build up a sound reputation with countless repeat customers who have their driveway cleaned annually. We now have a reputation as one of Hull's most reliable driveway cleaning companies. We have been able to achieve this because of our competitive pricing and commitment to first class customer service. Our attention to detail is what sets us apart from our competitors. Our clients receive a first rate service each and every time. Why Do You Need 3 Flow Driveway and Patio Cleaning services? A fresh and clean looking driveway or vibrant patios around your home will add value if you are in the market to sell your property. If you're not in the market to sell, then it just makes you feel content and proud of your home. If your decking is looking shabby a good jet washing can help restore its vibrancy and shine. Driveways and patios that are covered in mildew, mould or other unsightly growth can become very hazardous and slippery when wet. Maintaining them means keeping the people who walk on them safe. If the surface you are cleaning is more delicate such as aggregate or stone pavers, doing this job yourself could cause long term damage. Professionals will use the correct cleaning methods that will not cause damage to your surfaces. Driveways or patio that have mildew or mold growing on them are not only detrimental to your health outside, but will follow you inside your home if left untreated. Regular pressure washing and maintenance of your patios and driveways can prevent decay adding years to their lifespan. Call 3 Flow today on 07880798531 / 01482 802323 for a free quote and see how we can help you with your driveway and patio cleaning.